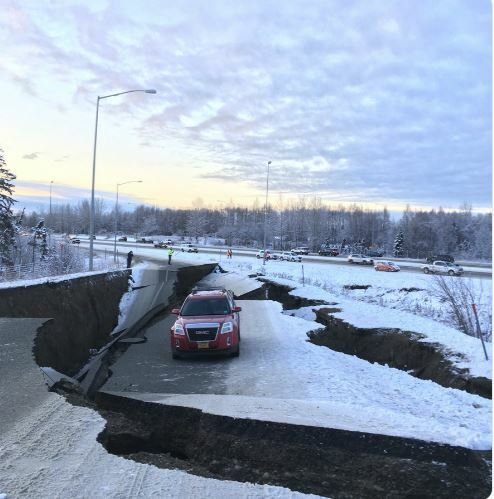 One of the most striking scenes from this morning’s earthquake in Anchorage is a photo of an SUV sunk in a crevasse that opened up on a Minnesota Drive exit ramp. Rienka watched it happen. He was driving northbound on Minnesota just behind the SUV. His own vehicle started moving oddly in the quake, so he pulled over, thinking he had a flat tire. “And then I watched the car in front of us start to sink as the road pushed out to the left,” Rienka said. He said the exit ramp onto International Airport Road seemed to slump away. He was trying to keep his 7-year-old calm, but each time he looked up, the SUV ahead had sunk more. Riekena says the driver seemed unharmed and police were soon on the scene. Riekena wasn’t sure who gave the motorist a ride, but thought he’d called a friend. Anchorage authorities reported no deaths or serious injuries by mid-day. The Alaska Department of Transportation is reporting road damage throughout town, on the Seward Highway and the Glenn Highway. Many traffic lights are out as well.